While at Sundance earlier this year I heard from a colleague who had attended a showing of Columbus, the feature debut of renowned video essayist Kogonada. She had walked out of the screening because after an hour nothing had happened, and it was too slow. She didn't know what it was about. 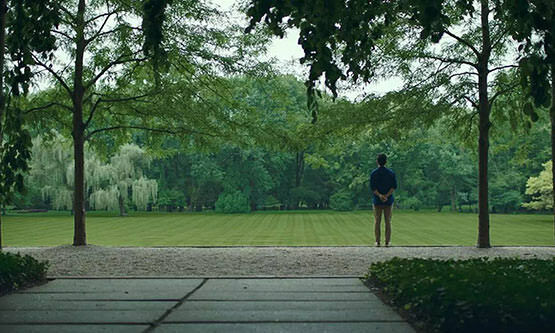 I can see that Columbus is a very subtle film, it's soft-spoken and earnest on a level that is the closest I've seen an American film come to the works of the great Hirokazu Koreeda. But it's also gorgeous and pure, reflected not only in the otherworldly architecture of the titular Indiana town, but in the performances. They are too rich to ever be boring. Columbus is an unexpectedly amazing film, the kind that leaves you with a shocked smile when the credits roll. It takes you by surprise, making you feel as much about the structural integrity of modernist architecture as in the structural integrity of human relationships. 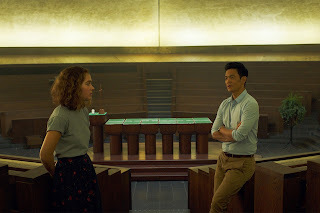 From top to bottom the cast is superb, beginning with Haley Lu Richardson, who you may have seen overshadowed in The Edge of Seventeen and Split. Here she proves herself more than capable as Casey, a Columbus native who has fallen in love with her odd little town. Odd, in that you don't expect such a random place to be an architectural mecca, a virtual playground of experimental designs (their public library is a National Landmark) from the world's leading architects. A recent high school graduate, she has no desire to leave like most of her peers, including her nerdy librarian buddy (Rory Culkin) who carries a torch for her. She's tough, vulnerable, and eager to share with others why she loves Columbus so much. All she needs is a listener. 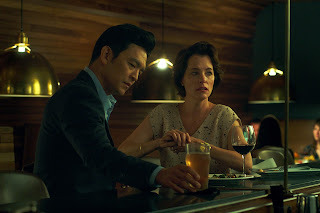 Casey is brought into the orbit of Jin (John Cho), an American ex-pat from Seoul who arrives in town to care for his ailing father, a prominent modernist architect. The film begins with the father collapsing suddenly, mere feet away from his star pupil (Parker Posey), an event that is about as close to dramatic as this movie ever gets. The rest is subtle grace notes, with Columbus' landscape creating a fantasy world that is like walking through a living dream. Jin is forced to stay in this town he doesn't really like until his father either dies or recovers, while Casey is wandering aimlessly through her next steps, partially out of concern for her troubled mom (Michelle Forbes, always a welcome addition). Columbus is about how these two wayward souls come together and forge a connection through architecture, art, and their mutual familial obligations. It's a film with long, thoughtful conversations that dig deep into each character's mindset. If you think that sounds dull, well, you'd be wrong. Each discussion, which range from the country's rapidly declining attention span to the building of a local hospital, are peppered with jokes and euphemisms, factoids and tidbits, all of which lend color to the world these characters are currently stuck. And in the process we see the cold, standoff-ish Jin begin to open up about his family and his separation from them. Casey sees in him a curiosity, someone who comes from outside of the town she's never left. But she approaches family from a very different perspective than him. For her, she would rather put her own future on hold rather than leave her mother behind. What grows between them isn't romantic; their friendship echoing Sofia Coppola's Lost in Translation in form and substance. Columbus is about two people who meet one another at just the right time in their lives. Jin is there to help Casey gain the confidence to tackle the future head on, while she helps Jin get over the pains of the past. 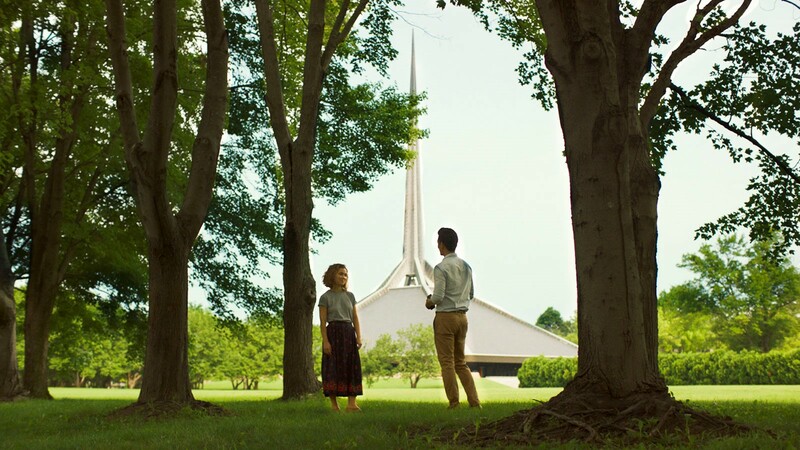 Columbus is a simple, beautiful story told well in word and image. While sparse in narrative, Kogonada's perfectly framed shots speak volumes. If you've ever seen some of the work Kogonada has done for Criterion then you may have expected some the meticulously composed images on display in Columbus, but they are extraordinary nonetheless. It's made me want to book passage to Columbus, Indiana as soon as possible, and not just to throw tomatoes at Vice President Mike Pence's childhood home. Well, maybe I can do that, too.